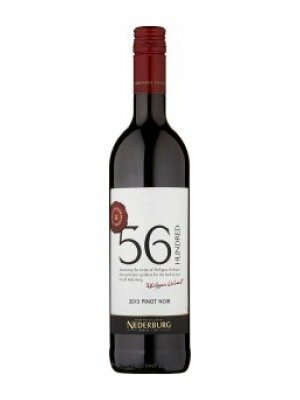 Nederburg 56 Hundred Pinot Noir is a popular South African Red Wine available from Tesco Wine in 75cl to buy online. Visit Tesco Wine for the best price for 75cl of Nederburg 56 Hundred Pinot Noir or compare prices on our other South African Red Wine products. Red South African WineHonouring the vision of Philippus Wolvaart who paid 5600 guilders for the land he was to call Nederburg.Philippus WolvaartWhen every vintage is worth the wait - smooth drinking every time. Light, fresh and fruity with bright cherry flavours and sweet spice. A delicious Pinot Noir - soft-textured and smooth-drinking. Enjoy with seafoods, poultry, tomato-based pizza and pasta toppings. Where to buy Nederburg 56 Hundred Pinot Noir ? Nederburg 56 Hundred Pinot Noir Supermarkets & Stockists. You can buy Nederburg 56 Hundred Pinot Noir online in most retailers and find it in the South African Red Wine aisle in supermarkets but we found the best deals online for Nederburg 56 Hundred Pinot Noir in Tesco Wine, Tesco Groceries, and others. Compare the current price of Nederburg 56 Hundred Pinot Noir in 75cl size in the table of offers below. Simply click on the button to order Nederburg 56 Hundred Pinot Noir online now.